This article was originally published on the Australian Strategic Policy Institute‘s The Strategist on 20 November 2017. On 7 July, 122 states voted to adopt a new Treaty on the Prohibition of Nuclear Weapons. It articulates the world’s collective revulsion at the humanitarian consequences of the use of nuclear weapons, under any circumstances. The foreseeable effects of use in the indeterminate future make the possession of bombs today morally unacceptable to the international community. The treaty’s primary intent is to stigmatise nuclear weapons through a legally binding prohibition instrument in order to induce movement towards nuclear disarmament by the bomb-possessing countries. The latter group boycotted the conference and have rejected the treaty. No weapons will therefore be destroyed. Supporters insist that, even so, the treaty will have an impact on key global nuclear norms. With 50 ratifications to bring the treaty into force, the normative effect may be limited at first, but it will begin to strengthen once the number of parties crosses the psychological threshold of 100. It will gain further weight if some of the key NATO and Pacific allies (Canada, Norway, Japan, Australia) defect from the rejectionist camp and sign. In regulating state conduct, both laws and norms serve enabling (licence) and restraining (leash) functions. Norms are understood differently by lawyers and political scientists. Legal norms impose binding legal obligations. Political norms create moral obligations. But the latter can still be encased in a wider legal context and have legal effects. The history of human rights movements (suffrage, anti-slavery, anti-apartheid) shows that, while the social movements are motivated to enact moral norms into law, the moral authority of the norms by themselves exert a powerful ‘compliance pull’. Treaty supporters and opponents are united in reaffirming the existing norms against nuclear proliferation and testing. It will also be deployed by supporter states and civil society advocates as evidence of a new global political norm against possession. In addition, the ban treaty’s legal effect will lie in strengthening the disarmament norm under Article VI of the 1968 Nuclear Non-Proliferation Treaty. It removes the NPT-based legal and legitimising plank for continued possession, deployment and doctrines of use by the nuclear powers. Meanwhile, the no-first-use norm, buttressed by consistent and widespread state practice, is arguably a mandatory norm. One common explanation for the non-use of nuclear weapons since 1945 is that the nuclear powers feared assured mutual destruction. An alternative explanation is that the normative taboo against the use of nuclear weapons is so strong that on several occasions they accepted defeat in places like Vietnam and Afghanistan rather than use the bomb to destroy their enemies. Lately, technological developments have begun to blur the dividing line between conventional precision munitions and nuclear weapons. The ban treaty will harden the normative boundary between conventional and nuclear weapons. Nuclear weapons obliterate the distinction between combatants and civilians that is central to every moral code in all cultures and civilisations. 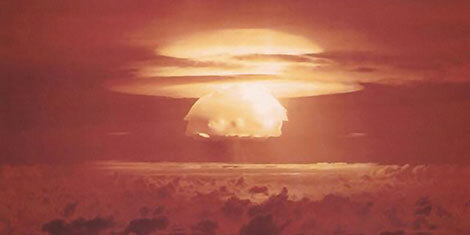 Most countries have chosen nuclear abstinence because people overwhelmingly abhor the bomb as deeply immoral. On 3 July, the ban treaty conference president, Ambassador Elayne Whyte Gomez of Costa Rica, said: ‘Each one of us has assumed the historic responsibility to give humankind an instrument that reflects the moral imperative of prohibiting nuclear weapons and leading to a future free of nuclear weapons.’ The treaty’s preamble reaffirms that ‘any use of nuclear weapons would also be abhorrent to the principles of humanity and the dictates of public conscience’. Another critical legal gap that has been closed is the threat of use of nuclear weapons. Arguably, such a prohibition is already covered under the general prohibition on the use or threat of use of force in Article 2(4) of the UN Charter. The political reality, however, is that threats to use force are a regular staple of world affairs (‘All options are on the table’). Given the current state of nuclear politics, the inclusion of an explicit prohibition on the threat of use of nuclear weapons fills a legal gap. In addition to reinforcing the norms of non-possession, no testing and no first use, the ban treaty’s prohibition on the use and threat of use undermines the contrary norm of nuclear deterrence. The main objection of the possessor states to the treaty, and the worry of many independent analysts, is that it will have the perverse effect of undermining nuclear peace and perhaps triggering major-power war. The worry is especially acute at a time of an exceptionally adverse international security environment. The nuclear powers have institutionalised deterrence as a permanent national security doctrine. By contrast, the ban treaty begins with the unequivocal stigmatisation of the possession, use and threat of use of nuclear weapons. Because it is a UN-approved treaty resulting from a mandated multilateral conference, it gives authoritative legal underpinning to the civil society-led stigmatisation of nuclear weapons. Anti-nuclear advocates in all the possessor and umbrella countries can draw on its legitimacy to alter the prevailing domestic normative context that shapes how people think about and act in relation to nuclear weapons. Arms control advocates will demand that the nuclear-armed states take the necessary steps to create the more favourable security conditions that will reduce nuclear risks and facilitate practical nuclear arms control and disarmament measures. A good analogue for the potential normative effect of the nuclear ban treaty is the Ottawa convention that banned landmines. Few today would deny that it has shaped the behaviour even of non-signatories. And several countries that strongly opposed it when it was mooted and adopted, including Australia, were persuaded to sign by the force of domestic and international opinion against the limited real-world utility of the mines. Ramesh Thakur is a professor at the Australian National University and co-convenor of the Asia–Pacific Leadership Network for Nuclear Non-Proliferation and Disarmament. Let us all make it clear to our representatives that we will no longer tolerate nuclear weapons and the dangers they pose to us all.